An interesting group of charts that tend to show the movement of listings, both rentals and properties for sale in Wellington only. 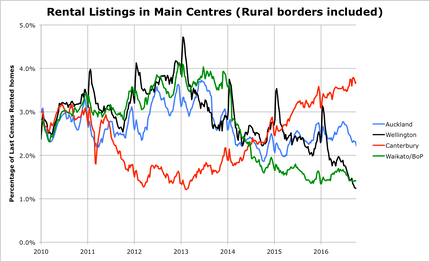 �This data is weekly, taken off the Trademe site every Monday morning since 2009. Other than Wellington regions are for rental inventory only, a unique set of data not published by Trademe. The combination of the two provides an insight into the number of properties available for households in the market for a change, either by rent or buy �This combination is the full supply/demand information, because often people are making the decision to rent or buy, based on current rents, vs purchase prices and availability. The percentage of properties listed is normally in balance with about 2.5%, any more and there is a glut and prices are probably falling, any less and the reverses true.